Research shows that visuals are a key to presenting information clearly and persuasively. If they are designed properly, trial timelines are one of the most important demonstrative aids you can use in any legal setting to persuade a fact finder. Timelines are key exhibits in most trials. They help orient the jury or judge, and serve as a memory stimulator for the trial lawyer and expert witness. They can also be an effective persuasion device if they are set up as a permanent exhibit at trial. and even persuades when created correctly. Here are some quick and interesting points about timelines. Any timeline is meant for the jurors or the judge to understand. It’s a device that makes the case clearer to them. The timeline is not primarily intended to jog your memory. You should know your case perfectly or nearly perfectly without the timeline. In general, the timeline should focus on the relative position of the events in the story that it tells, not on the date bar. If you are going to highlight a portion of the timeline, highlight the events themselves, and don't make the date bar the focal point. Although a lot of people think a timeline needs a complicated legend or key, the truth is that it should be fairly self-explanatory. Rather than a legend, use logos, icons, company symbols, or other design elements to explain what the timeline represents. Jurors’ attention won’t remain on a timeline that is too long and complicated. Revise your timeline so that it focuses on the most important events, not on all events that are conceivably relevant. Don’t make the timeline too small. Otherwise, jurors will lose interest. The timeline should use no smaller than 20-point type. 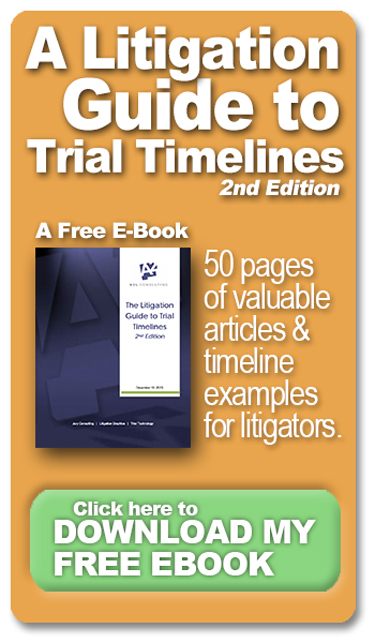 All these points are discussed at length in our latest e-book – the revised version of The Litigation Guide to Timelines. The book is taken from our experience at A2L Consulting, building thousands of different types of trial timelines since our founding in the 1990s. It is drawn from our decades of experience with all major law firms. and much more in this complimentary e-book.